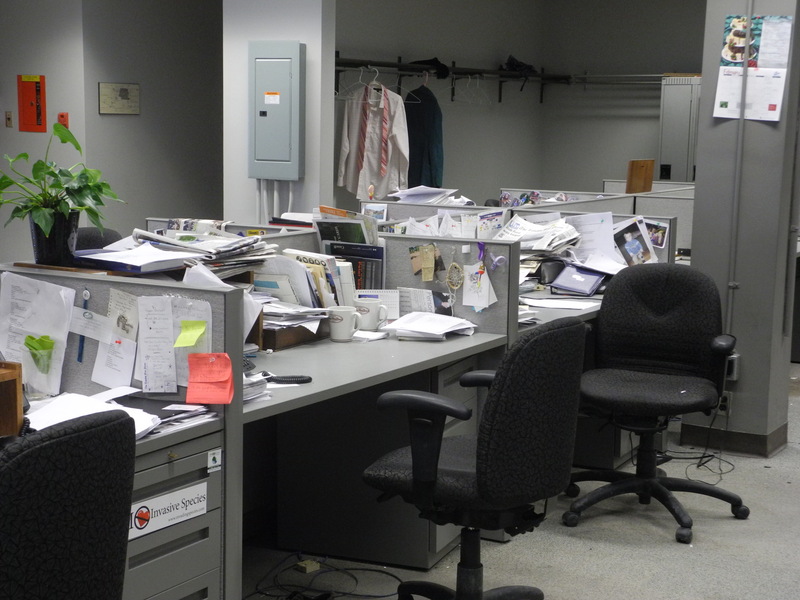 A newsroom is an unattainable place for most people. It is intriguing precisely because it is one of those places where the magic happens (another one is the stage, but more on that later). I’m lucky to have had the opportunity to enter that world and to witness what goes on behind the scenes. In January, I made my way to the newsroom every weekday, coffee in hand, knowing fully well that I was probably going to need more throughout the day. I arrived at the tall tower, said hello to the security guard who seemed bored out of his skull, scanned my card and passed the control rooms. The morning routine in the newsroom consists of skimming through newspapers to have a sense of what’s happening, even though story ideas don’t necessarily stem from there. There is also a need to know what’s happening inside of the newsroom and on social media. In less than an hour, my brain is already flooded with information. News lives in the newsroom. Days are filled with important conversations about what is happening, where is it happening, what the coverage should be depending on sections and shows and to which outcome. Inasmuch as there are as many kinds of journalists out there, they generally are smart, witty and quick on their feet. By journalists here, I include everyone working in a newsroom (besides the bored security guard). Journalists report on stories and then producers or editors decide what goes on the air, the airwaves, the page or the Internet. What goes on in a newsroom is serious business, but not always. As people who talk about car crashes and war zones every day, the newsroom is renowned for its dark humour. The newsroom is also one of those few places where long conversations develop over grammar or the meaning of a sentence. Getting into a newsroom is no easy feat. It takes perseverance and a good occasion, such as an internship. There is an air of mystery surrounding it, and for good reason: a newsroom is an information church, a sacred place where stories are told and decisions are made. It was daunting to enter the newsroom for the first time. It appeared complex and scary because it is corporate and people seemed serious. Not only do they appear busy, but they also know what they are doing- and they get stuff done. One of the hardest things for me as a young journalist is actually figuring out what I am doing- and how to do it. Observing helps a lot in those situations. I needed to know the basics before stepping in a newsroom, which is why I am forever grateful to my studies in journalism for showing me the way. We got a sheet with tips on how to be ”the best intern in the world” and words of encouragement from professors. A newsroom may look like any open-concept office with people behind computers frowning their eyebrows, drinking coffee and wearing blazers. The difference here is that these people make a big difference in the world: their job is to deliver the news. It takes many journalists to research, post, write, host and produce (among other things). People don’t necessarily sit next to each other in a logic order in a newsroom. It is common to see people walking over to their colleague’s office, asking for information, advice or confirmation. Most people seem to get along in the newsroom, and some look more friendly than others, just like at school. Some people look imposing because of their innate authority or position (often a mix of both), but mostly, everyone looks busy and focused, and always on to the next one. In the newsroom, the week tends to start with a bang. Mondays sets the standard for the week. My first day in the newsroom this year was the return to the office post-vacation. Office chatter could be heard, the kind of conversation you overhear but don’t participate in when you don’t know anyone. “Oh hey, how was your vacation?” I hoped that I would be able to have such conversations soon, to feel that I was part of the team. A newsroom is not necessarily the healthiest place. There are a lot of bleary-eyed people who look like they could deal with some vegetables, a yoga class or a few more hours of sleep. The problem is that they are often over-stressed, over-worked and their time is limited. When people bring food to share, it’s always super sweet (literally). Most the time, the food consists of cake and donuts. The sugar rush can be welcomed as it helps to keep going. There was a fabulous lady who baked homemade cakes filled with fruit, such as pineapple or blueberries. Definitely a newsroom highlight. Not surprisingly, I like being in the newsroom, but I prefer getting out in the open. Being out reporting on the field is more exciting to me because it is real life happening in real time. I like interacting with people and learning from them- that’s one of the biggest draws of journalism for me. Of course, a balance of both is ideal. By the end of my month in the newsroom, I got to know most people and had the chance to work with many. People knew my name and I knew theirs. The weather forecaster brought me espressos in the afternoon, warming my heart and giving me a necessary kick to finish the day. When the time permitted, I had lunch with a bunch of journalists, and being part of their fun conversations made me feel like I belonged. The newsroom is depressing these days as cutbacks are becoming the new normal. There are too many empty offices, and dust is accumulating everywhere. Sometimes, the size of the newsroom itself shrinks. It is bad news for journalism because everyone working in the newsroom has to work harder with less. This is obvious and not an easy thing to swallow. There are many tales of burn-outs, lay-offs and precarity. It seems as if life is dwindling with the funds. Less money means less opportunities and more stress. I sometimes wonder why I decided to go into this stressful business. As a young journalist working in my first newsrooms, I feel the pressure. I also feel the need to come up with creative ideas and solutions to make journalism richer and jobs better. I don’t claim to have the solution, but I do have ideas and thoughts that I share with fellow journalists on a regular basis. A newscaster came to speak to my group at school recently. She said that the younger generation is more focused on balance. It seems logical to me and my peers because we see how working 60 hours weeks is detrimental to mental and physical well-being. At the same time, the newsroom is still thriving. The public need their information. They want to know what’s going on. More than ever in history, people are hungry for content. For the moment, I still have a bit of time to spend in the newsroom in order to learn the tricks of the trade. I did learn a lot already, which is the underlying value of internships and volunteer shifts, but I’ve got a long way to go. I know that I still have things to learn in the newsroom, but also that I won’t spend my whole life in one. I need change and there is a lot that I want to do outside of the newsroom. For now though, my passion for journalism and my taste for the newsroom’s structured chaos will keep me going back.